The Outbound option groups the settings one needs to do in order to connect the PBX to the outside world. A gateway is FreeSentral's connection to another FreeSentral, other PBX or network. It is the address you choose your call to go to. Go to the menu Outbound. Select Add gateway from the submenu. Select the type of gateway you want to add: with registration/without registration. Choose "with registration" when you know you have an username and a password that Yate should be using to authenticate to another server. Select the protocol. Depending on the type of protocol you select the information to add a gateway will be different. Fill in the box with the required information. Press Advanced to do advanced configurations. Press Save to finish the operation. Press Reset to delete the information and rewrite new one. Select Gateways from the submenu. Here you have a list of all the gateways you have added so far. Press the edit button associated with the gateway you want to edit. Press Reset to delete the information and write a new one. Press the delete button associated with the gateway you want to delete. 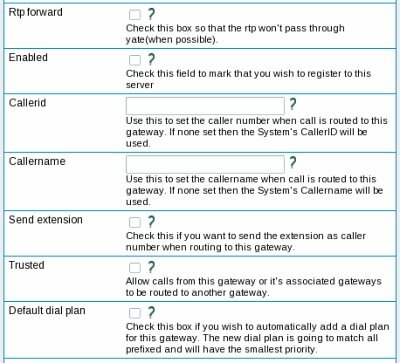 To define a dial plan means to make the connection between a call and a gateway. 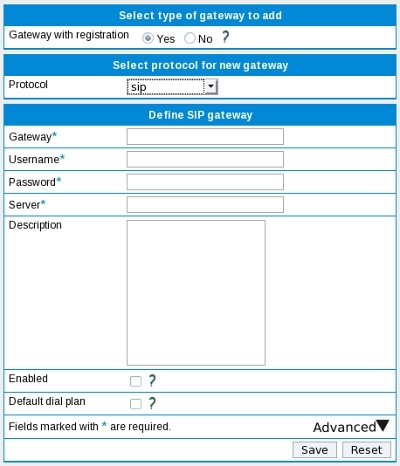 You have the possibility to direct calls of your choice to go to a specified gateway. 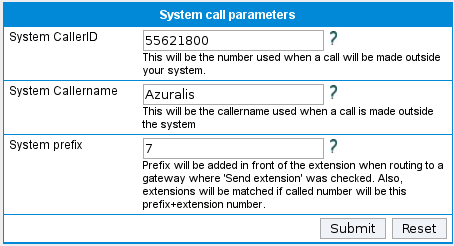 When a call comes the gateway whose prefix best matched the called number will be used. If more than one gateway is found, they will be ordered by the priority(a higher number means a smaller priority). Freesentral offers fallback routing. A maximum number of 3 routes is selected(this number can be changed from config.php from Yate share/scripts). If call fails then the next available route is tried. Select Add dial plan from the submenu. 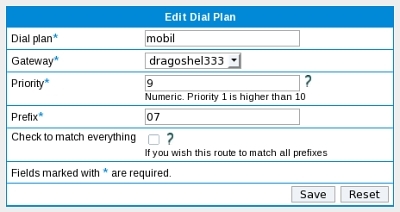 Select Dial plan from the submenu. Here you have a list of all the dial plans you've added so far. Press the edit button associated with the dial plan you want to edit. Press the delete button associated with the dial plan you want to delete. 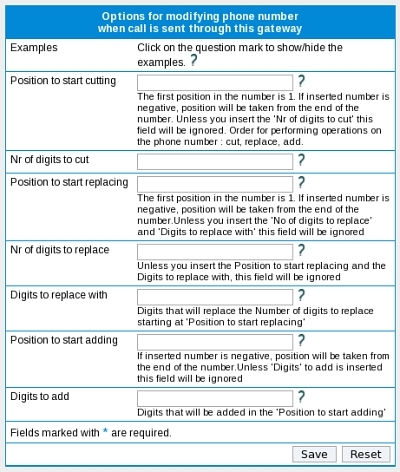 Press the modify number button associated with the dial plan. You have the option to set a default caller number and caller name for all calls when making calls to outside your system. 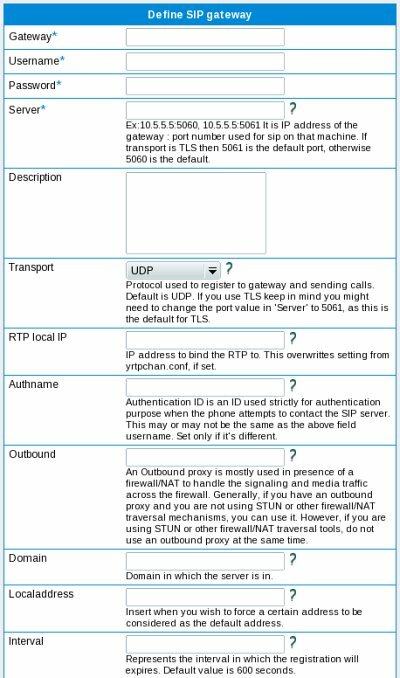 This parameters can be set per gateway and they will be used instead of the default one. Freesentral protects your system against attackers trying to make expensive calls. The system counts the number of calls for the specified prefixes and if counters reach the specified limits, calls for those prefixes are disabled. By default all international calls are counted. By default freesentral comes with '00' (Europe international prefix), '011'(US international prefix) and '+' (prefix for numbers in e164 format) as international prefixes. You can refine them and specify just certain expensive destinations and leave the other international prefixes uncounted. Depending on the country you are located in, certain prefixes won't be counted as international even if they match the international ones. Define more refined prefixes for the exceptions for the national prefixes/international prefixes that are often used in your system. You can disable all international/expensive calls by selecting "disable" in the "International Calls" dropdown. If any of the limits specified in Settings>>Limits international calls are reached then international calls will be disabled. In this case you will see a red box with 'International calls: off' and the reason and time when they were disabled on the home page. You can enable them again by either clicking on the 'Enable' link as seen in the image below or by connecting with telnet to yate and typing 'international on'.